Oil Price Tremors Not Rattling Texas. Yet. A steep drop in crude oil prices threatens to slow drilling in some U.S. oilfields, but officials in Texas' hottest shale plays say they're not worried. With crude oil prices nose diving in recent months, unsettling fears of idled rigs and plummeting profits have begun creeping through companies and countries whose livelihoods are tied to oil production. But officials in some of Texas' booming towns aren't breaking a sweat just yet. In West Texas’ Permian Basin, Midland officials echo that notion. “For us as a city, it’s not any cause that’s telling us to slow down on our planning,” said Sara Bustilloz, a city spokeswoman. Busts famously follow booms, but economists and industry experts say towns atop Texas’ biggest drilling zones probably aren't looking at the beginning of a bust – at least not yet. In the Permian Basin and Eagle Ford, operators have poured billions of dollars into pipelines and other infrastructure, so they're not likely to walk away unless things get much worse. Spurred by technological advances like hydraulic fracturing, Texas is producing more oil than it has in 30 years, and pumping twice as much as it did just three years ago. It now accounts for more than one-third of all U.S. production, and the Eagle Ford and Permian have driven much of that growth. The surge, however, comes as international economies have stalled, and demand for oil is dropping. Meanwhile, OPEC – the Organization of the Petroleum Exporting Countries­ – has not cut production, feeding an oil glut that is driving down prices. Estimating break-even points on a given oilfield – or a section of one – requires its own equation, but several experts said Texas’ biggest fields should stay profitable if prices don't fall much further. Even at $75 a barrel, most operators might keep their wells pumping, Faulkner said. And $50 or $60 is profitable in parts of the Permian Basin where operators drill vertical wells, which are cheaper than the horizontal wells that have driven much of the Texas boom. A continued slide may temper the boom and slow exploration in emerging shale fields. But the state should fare better than others, experts say, because major companies in recent years have poured millions of dollars into pipelines, office buildings, housing and other infrastructure – investments they will not likely soon abandon. “Texas has been shielded so much, because of the Eagle Ford, because of the Permian,” Faulkner said. In Karnes County, for instance, Polk Operating, based in Bowie, opened a 200-acre oilfield recycling plant. And Dallas-based Southcross Energy Partners spent $7 million to extend a pipeline, according a report by the University of Texas at San Antonio. The pipelines make moving oil cheaper, giving Texas operators an edge over parts of North Dakota’s Bakken Shale and other fields that need trucks or trains to get their oil out. 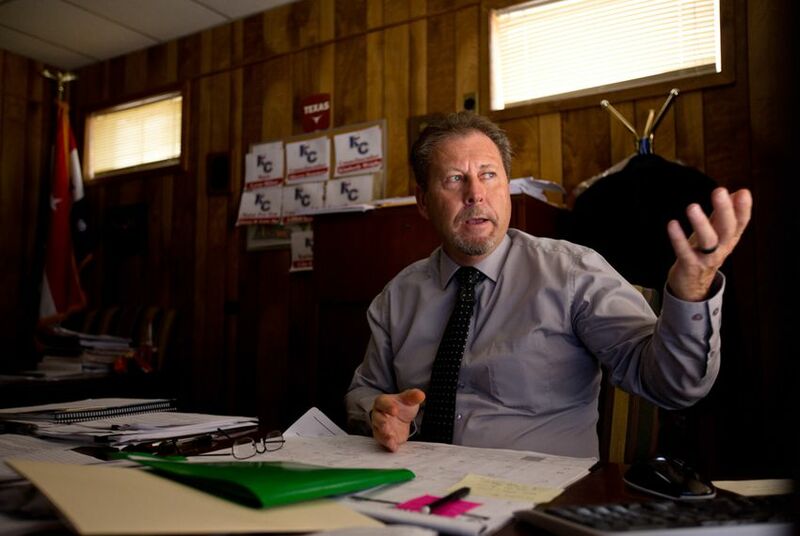 If the market’s volatility does temporarily dampen growth, officials in Karnes City and Midland – both grappling with the boom’s demands on housing, roads and other infrastructure – say they wouldn’t mind some time to reset. Disclosure: The University of Texas at San Antonio is a corporate sponsor of The Texas Tribune. A complete list of Tribune donors and sponsors can be viewed here.